This Perfect Pressure premium supplement contains an exclusive blend of vitamins, antioxidants & pure botanical extracts formulated to support healthy blood pressure. Natural, drug-free and made in the USA! Does your doctor recommend using all-natural supplements as part of your overall heart health regimen? This herbal formula is fortified with key nutrients like Vitamin C, B vitamins, niacin & folic acid. The beneficial antioxidants such as Hibiscus Flower, Olive Leaf & odourless garlic; and botanical extracts such as Buchu Leaves, Uva Ursi, Juniper Berry & Green Tea. These ingredients are thought to temporarily relieve symptoms such as stress and slow blood circulation. This product also contains forskolin, a compound found in the roots of the plant Plectranthus barbatus (Coleus forskohlii), which has been used for centuries to support heart health. According to the University of Michigan website, forskolin was shown to provide marked cardiovascular benefits in a preliminary clinical study of the extract. Perfect Pressure is DRUG-FREE, so you can feel good about taking it every day! Plus, it’s made right here in the USA in an FDA-inspected facility. We use only the purest, quality-tested ingredients in our supplement. Want to optimize your heart health naturally? 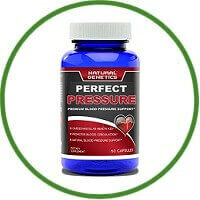 Perfect Pressure is the ideal complement to a nutritious diet, regular exercise, and doctor-prescribed regimen. Try it for yourself today!